thyroid eye disease is a manifestation of Graves' disease but can occure in patient who may be hyper/hypo or euthyroid. what featurs are specific to Grave's disease? 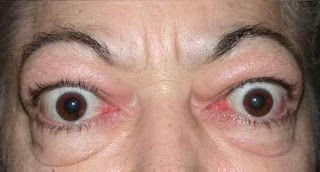 exophthalmos (protruding eye ball) and ophthamoplagia (limitation of eye movement)occure only in patients with Graves' disease. lid retraction and lid lag occure in any form of hyperthyrodism due to sympathatic over-stimulation. For this lady: Exophtalmos, lid retraction. Other eye signs that maybe observed include: diplopia, lid lag, proptosis, complex ophthalmoplegia. ophthamoplagia is class 4 in the grave's eye disease clissification.that means it is specific for Grave's disease as far as thyroid eye disease is concerned.the question is can ophthamoplagia ocure in other forms thyroid eye disease apart from Grave's?the answer in my opinion is no.